How do I get freelance copywriting work? I’ve been a freelance copywriter since 2009, and a lot of newbies come to me for advice on how to find copywriting projects. Here’s my best advice for getting your freelance copywriting career up and running. In 2018, the annual PCN survey reported that the average rate charged by freelance copywriters was £342 per day. Do you have a specialism that you enjoy? Lean on that if you can. It’s possible to be a successful copywriter without specialising, but it’s easier to be known and remembered if you can tie your skills to a particular field. That said, I started out in 2009 by announcing that I would specialise in technical writing for IT and the web. And yet here I am, almost a decade later, having worked on writing projects about TV remote controls, boilers, plastic injection moulding, recruitment, resource management and financial services (and lots of others). So, a niche is good but it’s not everything. Copywriters don’t go door to door, selling consonants and vowels by the pound. Start your freelance copywriting business by thinking about how you’ll be found online. WordPress has a steeper learning curve than the other, more graphical platforms – but it’s also a lot more flexible. Powering around 30% of all websites, WordPress has the potential to serve you well for years. Along with choosing the right platform, you need to pick yourself a good web hosting provider. At the start of 2017, I switched my web hosting provider to SiteGround, which was perfect for my WordPress site. SiteGround’s service has been excellent and I’m paying less now than I did with my old provider. Use your site to build authority and show people why they should hire you. That bit ought to be easy if you’re a decent writer, right? In fact, it can be hard to write objectively about yourself, and even harder if you’re new to the writing business and don’t have heaps of experience to fall back on. That’s OK. We’ve all been there. Try to understand what problems your prospective clients have. What good reason would make them spend cash money to hire someone to write words for them? If you can answer that question, you might be on to a winner. Be honest and be human. A lot of people try to be something they’re not, especially online. They’ll talk about their services in the third person. They’ll try to sound too fancy. Don’t do that. Be you. Don’t blather on too much but do talk the way you would in a one-to-one conversation. You won’t suddenly race up the Google rankings (that’s tough to do no matter how good your writing is), but you’ll make a good impression on the right people – the people you want to work with. My copywriting colleague Jorden Roper has lots of great posts on this subject, for example 7 awful freelance writer website mistakes that cost you clients. LinkedIn has been the most profitable social network for me in terms of finding new writing clients. It’s my favourite social platform and the place where I can pretty much guarantee good engagement on my posts. Clients who find me via LinkedIn are often willing to pay higher rates than those who find me via my website. Every time someone asks me for advice on a career in writing, I usually tell them to check out the great content created by some of my online buddies. Vikki Ross is a one-woman referral network for copywriting work. Jorden Roper shares helpful content for writers on her blog and YouTube channel. There are loads of copywriters I know, like and trust on my recommended copywriters list. Connecting with the right people will bring you a lot of the good stuff: mutual learning and support, camaraderie and inspiration. If you connect only with your peers, you might not get any work. Yes, there’s the possibility for referrals – but you need more than that. Look further afield and connect with the people who are most likely to give you writing gigs. If you have a niche, look for the decision-makers of businesses that operate in that field. Don’t expect these people to sit up and take notice of you straight away. Hiring a freelance writer may be low on their agenda. It might not even be on their agenda at all (yet). Invest time in building relationships with the people you want to work with. Follow those people on social media. Learn what they’re most likely to post. Engage by liking, sharing and commenting on their content. Help by offering relevant advice where appropriate. It can take a while to become a trusted source of information, but if you crack it then these clients will be more likely to come to you when they need a writer. 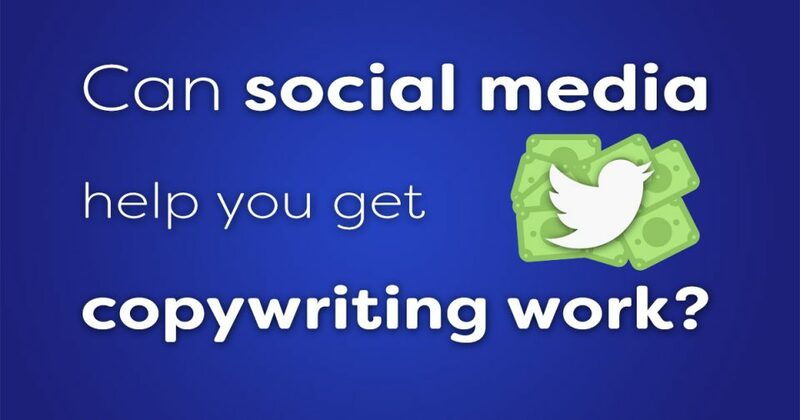 Can social media help you get copywriting work? Just because you’re literate, it doesn’t mean you can write well. Sometimes you just have a natural talent and that’s great. But most skills take a while to develop, and grabbing a little help along the way is usually a good idea. OK, you’ve done some reading. But what about going on a copywriting course? I know lots of training providers in the UK, my favourite being WordTree. I’ve been to two of their advanced courses and they were brilliant. Note that good-quality training isn’t cheap. Neither is it guaranteed to bring you success. Some people believe we should forget the rules, forget the study, live by our wits and just go and do it. That approach will work for some, but I know plenty who would prefer a more structured approach. Writers will naturally lean towards learning through reading, but another great way is to listen to podcasts. For me, that means I can consume helpful content when out walking or while cooking a roast dinner. You can do the same (listen to podcasts, I mean, not cook a roast). Member directory – advertise your services. Slack group – discuss issues and chat online with other members. Conference – meet copywriting colleagues and learn from the best. Discounts – save money on shared working spaces and professional indemnity insurance. There are also oodles of Facebook and LinkedIn groups for writers. For example, try The Copywriter, which is run by Eleanor Goold. Talking to others online is great, but the freelance life can still feel isolating. Think about going out and meeting other copywriters face to face at the various conferences and events that take place each year. For example, the annual PCN conference is held in London. There are also #copywritersunite meetups around the country – so don’t feel left out if you’re not close to London. I started by saying that you should get a website and a LinkedIn presence. That’s not where those tasks end, though. You don’t just create a website and then let it sit there. You don’t just fill in LinkedIn as though it were an online CV and then let it stagnate. You use these things as tools to show off the best version of you, and then keep them updated and relevant to your target audience. Speaking of which, have you worked out who your target audience is? This post will help you do the groundwork: Pen portraits. LinkedIn is good for that. Take full advantage of your connections from past jobs, and on friends and family. Don’t scoff: such contacts got me through my first year in business, and I don’t think that’s unusual. See what support you might be able to give them. Perhaps they need a new brochure or new copy for their website and just didn’t know where to turn for help. Sounds scary and it is a bit – but that’s not enough to put you off, right? Use ads on Google, Facebook and wherever else you think your target audience might be lurking. This means producing helpful content that lets you stand out as being a trusted person in your niche. It’s a slow-burn approach (don’t expect much to happen inside a couple of years) but it’s still a better long-term strategy than pumping money into advertising campaigns. Look at these posts about my approach and the effect it’s had on my website traffic. 1. The best way to get work is to do work. If you’re just starting out, write a blog, volunteer to write for a cause you support or small businesses you’re close to. Get copies of the work you create so you can build a portfolio and confidence in your abilities. 2. Learn to think of copywriting as a commercial activity – your clients need to see a return on what you do for them, so before you start writing, ask your client to help you identify ways you are going to measure the impact your writing has had (increased sales, inquiries, awareness etc). Then when you present the work you’ve done, you can also clearly spell out the impact it has had. 3. I also think there’s a lot of value in working for an agency before you go freelance – it gives you exposure to big brands and a crash course in what clients expect and the way to work with them. But to get that agency role, you need a portfolio… so back to point one. If you aren’t flying solo yet, ask yourself whether it’s something you really want to do. Freelance life isn’t all shiny MacBooks and caramel macchiatos in swanky coffee shops. It’s hard work. Check out Helena Baker’s unvarnished look at being a freelancer. When I was made redundant in 2009, I couldn’t get an interview, much less a job. I was forced into the freelance world because I had a three-month-old daughter to feed and I was damn sure not going to support her through unemployment benefit. So I worked hard and I got there. Things worked out for me. They don’t work out for everyone, and sometimes that’s not because of a lack of talent. These topics scratch the surface of what’s involved in starting out as a freelance copywriter. Perhaps you have some further questions and need a hand from someone who’s been there and done it. That’s OK – I’m here to help. Do you have questions about setting up your website, marketing your copywriting business or looking for freelance work? Book a video call and let me help you. Why me? Because I've been a freelance writer since 2009 and know what it takes to succeed in this field. Thanks to my consultation with John, I now have a clear idea of where I want to take my business – and how to get it there. The most valuable half hour I've spent on business planning for, well, ever! John's consultation service gave me tons of useful insight and solutions that I could apply to my business the same day. It's well worth the fee.